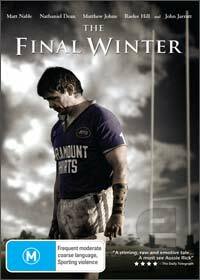 Set during the 80s, The Final Winter follows Grub a rough as guts rugby league player during the commercialization of the game. What sets this film apart is unlike from the stock standard sports flick, is the strong characters and their development throughout the piece. New comer, Matt Nable performs brilliantly as writer, producer and lead actor in this engaging Aussie flick. Nable's work is boosted by the the talent of John Jarratt, Nathaniel Dean and Raelee Hill with League star Matthew Johns in his big screen debut. Surprisingly this is also director Jane Forrest's first feature length film. For a low budget film with so many new comers, The Final Winter is executed with the precision of seasoned professionals. Nable's story of a man choosing his future as he assess his past, simply but elegantly crafted. The Final Winter is a triumphant showcase of Aussie drama at its best. As rugby league is the merely the backdrop, the story line can be appreciated those who aren't a fan of the sport. This is a truly rewarding drama.